The ACDS, World Bank and the Southern African Development Community’s (SADC’s) disaster risk reduction unit recently jointly hosted the first Disaster Risk Reduction Conference in Pretoria. The conference successfully brought together stakeholders from academia, international organisations, NGOs and government representatives from all over the SADC region. The aim of the conference was to present the current progress in reducing disaster risk and the future of DRR (Disaster Risk Reduction) policy and practice in the region. A Chinese delegation of the Guangdong province recently visited the NWU’s Unit for Environmental Sciences and Management (UESM) to meet with researchers and members of the university’s management team. The visit saw representatives of the North West province as well as the Free State Department of Agriculture in attendance. The aim of the visit was to engage researchers on future research collaboration initiatives. In this regard, the focus was on rice research collaboration within the Guangdong province. Researchers from the Aquatic Ecosystem Health subprogramme are collaborating with their peers from the Bauhaus University in Weimar, Germany. The collaboration has seen two workshops being hosted – one in Germany and one in South Africa. Funding for this research initiative is provided by the NRF’s bilateral programme. Recently a large number of colleagues and students from this subprogramme attended the South African Society for Microbiology’s meeting in Johannesburg. One of the staff members, Dr Danie La Grange, was elected to the national executive committee of the society as the publications secretary. Professor Juanee Cilliers will be heading off to Fukuoka, Japan to attend the Global Symposium on Urban and Territorial Planning, as well as the Spatial Planning Meeting which will be taking place from 30 July to 1 August. This comes after she was invited by the UN-Habitat to present her research at a global platform. The United Nations Human Settlements Programme (UN-Habitat) is the United Nations agency for human settlements and sustainable urban development. The annual conference of the Society of Environmental Toxicology and Chemistry (SETAC) is the scientific highlight for the globe’s ecotoxicologists. The NWU was represented by 15 academics and postgraduate students at the meeting held in Rome during the month of May. During the meeting the interdisciplinary research focus of the UESM was demonstrated through the participation of researchers from Microbiology and Zoology. Ecotoxicological aspects related to soils, micro plastics, nanomaterials, anti-biotic resistance and chemical stress ecology were delivered as oral and poster presentations. 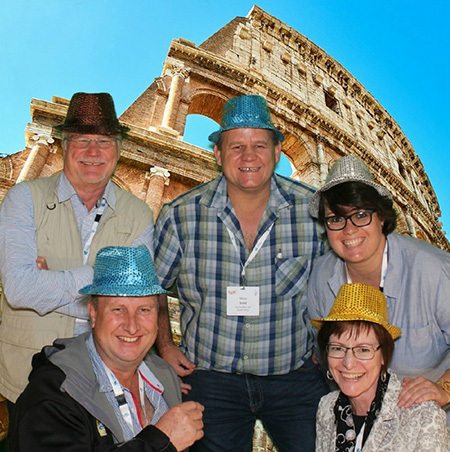 Professors Victor Wepener, Henk Bouwman, Rialet Pieters, Nico Smit and Dr Tarryn Botha attended the SETAC meeting in Rome.